Exciting news today as New York's Knitting Factory Records announce that they are to launch in the UK and Europe with nothing less than the reissue of their complete Fela Kuti catalogue! Knitting Factory Records was founded in 2002 as an offshoot of the celebrated Knitting Factory club in downtown Manhattan. 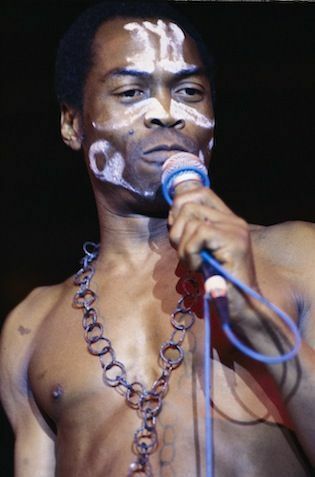 In 2009 they rebooted themselves after the granting of a licence from the Fela Anikulapo Kuti Estate for the worldwide re-release of his catalogue. As part of the group's UK/Europe programme, the complete works of Nigerian icon and Afrobeat originator, Fela Anikulapo Kuti, consisting of almost 50 albums, are being re-packaged, with in-depth track commentaries written by Afrobeat historian Chris May, and prepared for a three-batch re-launch between February and September 2013. The re-release programme will be spearheaded on February 1, 2013 by the release of The Best of The Black President 2, a deluxe 2CD collection curated by Senegalese-American R&B/hip-hop artist Akon, and including a DVD of Fela's legendary 1984 Glastonbury concert. Besides all this, Knitting Factory Records also have the catalogues of Instinct Records, Shadow Records, Shimmy Disc, Evolver Records and Young One Records and are now partnered with Partisan Records, (a Brooklyn-based, artist-run label). The Knitting Factory group of labels, are now opening up in the UK and Europe where they will be distributed by PIAS. "We are delighted to be working with such a diverse and forward-looking group of labels, and feel particularly privileged to be helping Knitting Factory Records bring the music of Fela Kuti to a new audience." "From the beginning, the Knitting Factory has always been about championing music by artists who are looking to break boundaries rather than adhere to them. And who better than Fela to show who we are and what we stand for! We're excited to have Knitting Factory Records continue that tradition and look forward to sharing our eclectic roster of incredible artists throughout Europe and the rest of the world." Fela died in 1997 but his legacy lives on. In addition to the vast catalogue he has left us, his Lagos home, Kalakuta, has been transformed into the Kalakuta Museum, aided by a $250,000 grant from Lagos State Government who finally, and, thankfully, have recognised his global cultural significance. His sons, Femi (right on trumpet) and Seun (below on sax), constantly tour the world with their respective bands. Afrobeat can be heard all over the planet. There are now in excess of 50 Afrobeat bands operating in Europe, the United States, Britain, Japan and Australia. Meanwhile, the new phenomena of 'Afrobeats,' performed by a digital-age generation of young African artists, is entering the mainstream charts. While musically departing from Fela's Afrobeat they are still paying homage to the man by adopting Afrobeats as the genre's name. But nothing compares to the original! In recognition of Fela's burgeoning global stature, a feature film of Fela's life and times is in the works with Focus Features, directed by Turner Prize winner, Steve McQueen. As well as that, the hit Broadway Musical, Fela!, recipient of 11 Tony nominations and 3 awards, directed by Tony Award winner, Bill T Jones, continues to play in the world's most prestigious theatres. "Despite everything they threw at him, Fela’s music and his message never lost their way. He was always real and he was always with the people. That’s why we love and miss him all the more." "Music is the weapon. Music is the weapon of the future."